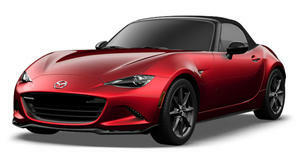 Can An Old Man In A New MX-5 Catch A Young Girl In An Old MX-5? Both are professional endurance racers. You don’t really need to run a test to see if the all-new fourth-generation Mazda MX-5 is better than the original Mk I. There’s been 25 years of evolution and technological advancements. Of course it’s better. If nothing else, in this demonstration, you will learn that the two roadsters, which incidentally weigh roughly the same, know how to get around a track. Behind the wheel of the original MX-5 is endurance racer Jade Paveley, who admits she’s younger than the car. While old-enough-to-be-her-father Owen Mildenhall pilots the latest iteration of the world’s best-selling two-seater sports car. The 1990 MX-5 is given a four second head start to even things out. So does the old boy in the young car catch the young girl in the old car? Place your bets.